Tom Mosser painted a self-portrait everyday to track his change over a year. Professor Alison Park explains the value of a longitudinal perspective on the latest episode of the BBC World Service programme The Forum. Listen to the episode on the BBC website. The Forum is the World Service’s flagship discussion programme, featuring prominent speakers from different countries and disciplines. When you look at old photographs of yourself, can you remember what was happening around you, and what you were thinking at the time? It often seems that we live now if an era of immediacy, where you press your foot on the pedal and race from A to B. Or click on a button and leapfrog from screen to screen. Maybe in our rush to engage the new, we forget what a treasure trove the past can be in helping us understand how much we’ve changed. The latest episode focuses on the long view – the small changes that shape a person over a year, a society over decades, or which alter the genetic make-up of humans over tens of thousands of years. 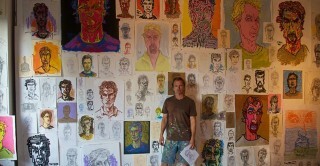 Tom Mosser created at least one self-portrait per day for the entire year of 2012 and continued to Feb. 10th of 2013 to create a total of 406 works. Tom created the portraits using both hands alternately or at the same time. He also created some using only the same hand. Some of the works are quick studies while others are larger and more elaborate works. He is repeating the exercise in 2016. Professor Alison Park is the Director of CLOSER, which works to maximise the use, value and impact of the UK’s longitudinal studies. These are studies which follow the same people over a long period of time. Before joining the UCL Institute of Education, Professor Park led a research team at NatCen Social Research, where she gathered information about the opinions and experiences of the British public. She is also interested in comparative survey research which shows how experiences and attitudes in the UK compare and contrast with those in other countries. Professor Eske Willerslev is a pioneer in the field of sequencing the genomes of ancient humans. He is director of Centre of Excellence in GeoGenetics and the National CryoBank and Sequencing Facility, situated at the National History Museum and the University of Copenhagen. He is also Prince Philip Professor of Ecology & Evolution at Cambridge University. In 2010 he sequenced the first ancient human genome. He has conducted the first large-scale multi-species ancient population genetic study, and established the field of environmental DNA, where modern and ancient DNA are obtained directly from environmental samples such as sediments, ice and water.